In 1991, a friend with relatives in the far northern region of Asturias in Spain-a region known for the quality of its smoked meats-returned from a trip with a can of handmade chorizo as a gift. At the time, Horne had no idea that this tiny tin of brick-red sausages packed in orange-streaked pork lard was a family treasure, or that she had been honored with the gifting of it. When her friend explained that the chorizo had been made from a secret family recipe that had been handed down for generations, Horne knew that she must try them, lest she offend her friend. That first bite is burned into her memory; the flavors unlike anything she’d ever tasted-tart on the palate with nuances of wood-grilled meat, a sensuous bite of smoked paprika, then finally the subtle, back-of-the-throat touch of spiciness. "When I first heard people talking of the new fifth-flavor perception they were calling umami, the savory element," says Horne, "I knew exactly what they were talking about. 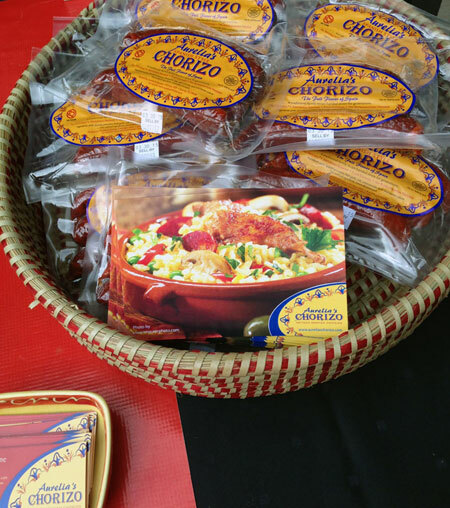 That tin of chorizo was the epitome of umami." 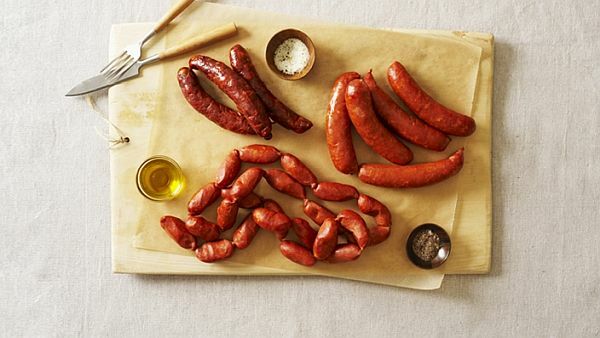 Horne began to research the history and process of making Spanish chorizo-an air-cured, dry sausage, unlike the fresh chorizo produced in Mexico. She discovered that in Asturias, the chorizo is smoked over chestnut wood so she scoured the far reaches of the U.S. looking for a source for chestnut wood, but to no avail. Further research showed that hickory, another nut-producing tree, would produce a similar sweet-smoke flavor. She found a source for the smoked paprika in Spain and ordered a large supply of it. Then she and her husband, Keith, began producing 80-pound batches of chorizo in their home kitchen. They wanted to be as true to the original recipe as possible, so they bought fresh hams, made the sausages and took them-along with the hickory wood-to their favorite barbecue and smokehouse joints and paid to have them smoked. But the results were never quite perfect because the smokehouses use hot smoke and chorizo requires cold smoking to produce the desired taste and texture. Even when the hams were put in the far back corners of the smokehouse, the atmosphere was still too hot. It was an intense trial-and-error process at first, and an arduous chore, as the Hornes had no commercial-grade equipment-just a standard KitchenAid mixer with a meat grinder and sausage stuffer. Adequate space to air cure the sausages was an issue, as well. Friends loved the chorizo, though, and were always willing to come over for a sausage-making party, but Horne began to worry about the safety of making the chorizo in a home kitchen. When the internet became readily available, she immersed herself in serious online research-seeking a definition for each term or procedure she didn’t understand and learning about the laws governing charcuterie production, the inspection process and things like water activity and pH. Horne went to local and state health departments to learn their requirements, and it was there that she discovered that the biggest roadblock would be the U.S. Department of Agriculture (USDA)-she would need their approval if she ever hoped to produce the chorizo for shipment out of state. She also learned that the USDA is very hesitant to approve cold-smoked charcuterie products. But Horne wasn’t about to give up. When her son graduated from high school and headed off to college, she dove headfirst into chorizo production. She went to the food science department at Texas A&M and consulted with professors who helped her develop a pasteurization process that the USDA would approve. Then she began a search to find a sausage maker who would produce the chorizo according to her specifications. The search eventually led her to Jonathan Pace at Smokey Denmark’s in Austin, where she formed a partnership. Horne purchased the necessary equipment to cold smoke and air cure the sausage, and Jonathan remodeled his operation to accommodate the production process. Aurelia’s Authentic Spanish Chorizo-named in honor of an elderly woman Horne met in northern Spain who taught her to really savor food and to appreciate its ingredients and respect those who made it-became a reality. Horne also wanted a pure, all-natural product with no fillers, binders, nitrates, nitrites or curing ingredients, so she had to come up with alternative natural products that were also USDA approved. She still uses the piquant smoked paprika from her original source in Spain, and she recently introduced two new products to the Aurelia’s line that also feature it. Aurelia’s Spanish Style Besitos are a version of the original recipe made using finely ground fresh meat formed into little bite-size sausages that are perfect party finger foods, and Aurelia’s Grillers are a finely textured, freshly ground product somewhat longer than the original chorizo-perfect for backyard barbecues.